This morning TTC Chair Karen Stintz outlined the new transit vision on Metro Morning (Listen Here) She explained that this wasn’t a cash grab. 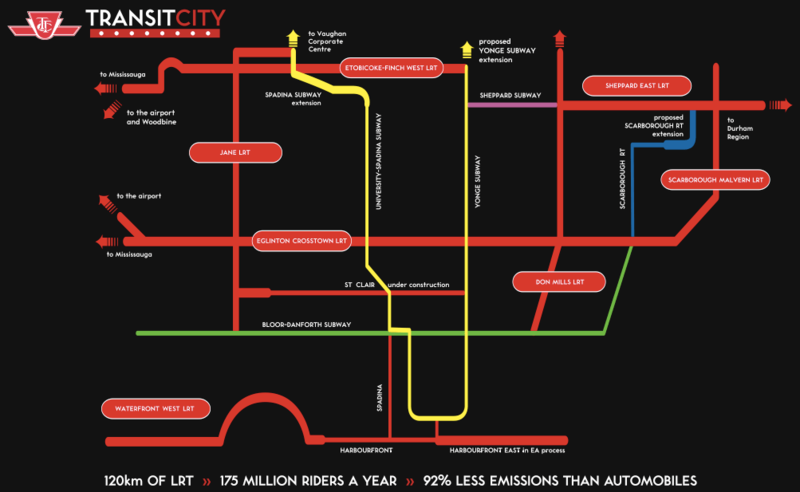 This is intended as a dedicated funding plan for the future of transit in Toronto. “Subways, Subways, Subways,” said Rob Ford during the last transit debate. I say yes to him, but also LRTs and Bus Routes and Streetcars and Go Train. Rob Ford may have made the debate loud but Stintz has somehow, quietly rolled out a plan, that just may work in Toronto’s favor. The $30-billion, 30-year proposal would transform the city — taking transit to all corners of the municipality. And, with provincial and federal help, the dream scenario would cost Toronto property taxpayers $45 a year for four years. Called OneCity, the massive plan is the brainchild of Councillors Karen Stintz and Glenn DeBaeremaeker, chair and vice-chair of the transit commission. The money, roughly a 2 per cent tax hike dedicated exclusively to transit, is bound to be the source of huge conflict at city council as early as October. Stintz has not declared her intention to run for mayor, but this proposal will put a bull’s-eye on her back. It is also expected to embolden Mayor Rob Ford, who will vigorously oppose it because it raises taxes. But if the plan finds traction among enough politicians at city hall — and there are enough transit goodies to satisfy councillors from all quadrants of the city — it could spark a humdinger of a battle that exceeds the rhetoric of last spring’s LRT-vs.-subway debate.